Medication nonadherence is a known problem after renal transplantation and can vary from one setting to another. Since it can lead to negative outcomes, it is important to develop intervention strategies to enhance adherence in a given setting using determinants identified through exploratory studies. We explored nonadherence in renal transplant recipients. A longitudinal survey was done with adult renal transplant recipients at a tertiary care public and two private hospitals of Kolkata. Subjects were followed-up for 1 year. After screening for medication adherence status by the four-item Morisky Medication Adherence Scale, those admitting to potential nonadherence were probed further. A patient was deemed to be nonadherent if failing to take medicines on appointed time (doses missed or delayed by more than 2 h) more than three times in any month during the observation period. A pretested questionnaire was used to explore potential determinants of nonadherence. Data of 153 patients recruited over a 2-year were analyzed. The extent of nonadherence with immunosuppressant regimens was about 31% overall; 44% in the public sector and 19% in the private sector (P < 0.001). Nonadherence with other medication was around 19% in both the sectors. Several potential demographic, socioeconomic and psychosocial determinants of nonadherence were identified on univariate analysis. However, logistic regression analysis singled out only the economic status. This study had updated the issue of nonadherence in renal transplant recipients in the Indian setting. Strategies to improve medication adherence can be planned by relevant stakeholders on the basis of these findings. Adherence with the therapeutic regimen is an essential requirement for successful therapeutic outcome in general and is an even more critical requirement for the success of an organ transplant. Failure to adhere to recommended medication regimens is a serious problem in organ transplantation with negative consequences for patients, health-care providers, health systems, employers, and society. Studies report wide variation in the prevalence of medication nonadherence in renal transplantation ranging from 2% to 68%. Dew et al. showed that the rate of nonadherence to immunosuppressant medication was highest among kidney transplant patients compared to recipients of other types of solid organ transplant. Didlake et al. reported nonadherence as the third leading cause of renal allograft loss. The assessment of adherence is, therefore, a critical aspect of post-transplantation patient care. The extent and predictors of nonadherence are likely to vary from one setting to another. Patients who report nonadherence may benefit from the use of various intervention strategies. These strategies need to be tailored to specific causes of nonadherence. An in-depth understanding of factors associated with nonadherence of medication is essential before the planning of any intervention. The nurse has a unique role to identify nonadherence as well as risk factors of developing such behavior and to suggest methods for intervening and supporting those patients. This requires knowledge of the adherence patterns of kidney transplant recipients in each community. The present study sought to explore medication nonadherence in renal transplant recipients in an urban Indian setting. We addressed essentially three questions. What is the extent of adherence with medication regimens? What is the association between various demographic, socioeconomic, psychosocial and therapy related factors and the nonadherence behavior? Can any of these variables be labeled as putative risk factor for nonadherence? It is expected that such information would assist health-care professionals to manage renal transplant patients better and would also assist policy makers in implementing measures that lead to improved adherence and outcome. Kolkata metropolis is the largest center for organ transplantation in eastern India. We conducted a longitudinal survey with adult renal transplant recipients, attending the nephrology posttransplant clinic of a tertiary care government hospital and two private hospitals in Kolkata. Following Institutional Ethics Committee approval, total of 179 kidney transplant recipients were recruited from July 2011 to June 2013 and followed up at the first outpatient visit after transplant and then at 3-month intervals for 12 months following transplant. The study procedure was explained, and informed consent was taken from the subjects at the time of recruitment. Purposive sampling technique was used to select subjects, excluding those cases where both subject and caregivers were illiterate. Only a few patients were excluded from the study because of their unwillingness to participate or anticipated an inability to follow-up at regular intervals because of the distance at which they resided. To screen for medication adherence status, the four-item Morisky Medication Adherence Scale with dichotomous response options was used. This is a standard tool for assessing medication adherence with a reliability coefficient (Cronbach's α) value of 0.61. Its reliability has been studied across a variety of diseases, and it has also been used with dialysis and transplant population. Potential nonadherent behavior was identified by positive response to any of the four items of the scale. These subjects were then probed further in detail and the actual adherence was assessed as the frequency of doses missed or delayed. A patient was deemed to be nonadherent if he or she failed to take medicines on appointed time (doses missed or delayed by more than 2 h) more than three times in any month during the observation period. To corroborate the patient's response about adherence, the caregiver was also interviewed during the visit. The interviews were conducted in a clinic setting maintaining privacy. Interview method was used to assess frequency of nonadherence and factors that might influence adherence. The interview schedule was prepared according to the World Health Organization taxonomy of adherence, 2003. The schedule captured data on number of suspected adverse drug reactions (ADRs). Stress related to these ADRs was assessed in a manner similar to Rosenberger et al. Infections and oncological side effects are not included in the Rosenberger's scale and these were added with the option to add other ADRs not listed. Stress from ADRs of immunosuppressant medication was measured on a five-point Likert scale: 0 - no stress, 1 - low stress, 2 - moderate stress, 3 - high stress, and 4 - very high stress. Validity and reliability of the interview questionnaire were established before actual data collection. Validity was established by validation of its construction by a senior nephrologists, statistician and senior nurses. Reliability was established through test and re-test method. The kappa coefficient rating of the categorical items and the intraclass coefficient ratings of the numerical items in test-retest setting ranged from 0.764 to 1. This was considered to be within acceptable limits. After establishing reliability, the original English version interview schedule was translated into the local language Bengali and back-translated to English by two independent language experts. Descriptive summary of the data has been presented as mean and standard deviation for continuous variables (also including median and interquartile range where distribution was skewed) and counts and percentages for categorical variables. 95% confidence intervals have been calculated where deemed relevant. Univariate analysis was done to assess the impact of individual explanatory variables on the adherence status using an independent t-test for parametric variables, Mann–Whitney U-test for nonparametric continuous variables and Fisher's exact test or Chi-square test for categorical variables. If needed, the subcategories were collapsed to make the Chi-square test technically feasible. P< 0.05 was considered statistically significant. Variables returning P< 0.05 was entered into a logistic regression model to identify potential risk factors for medication nonadherence through multivariate analysis. SPSS Statistics version 17 (2008, SPSS Inc., Chicago, Illinois, USA) and GraphPad Prism version 5 (2007, GraphPad Software Inc., San Diego, Californi, USA) software were used for statistical analysis. Out of 179 kidney recipients recruited, 13 patients were lost to follow-up and another 13 patients died before completing 1 year follow-up. Hence, the analysis was restricted to the remaining 153 patients. 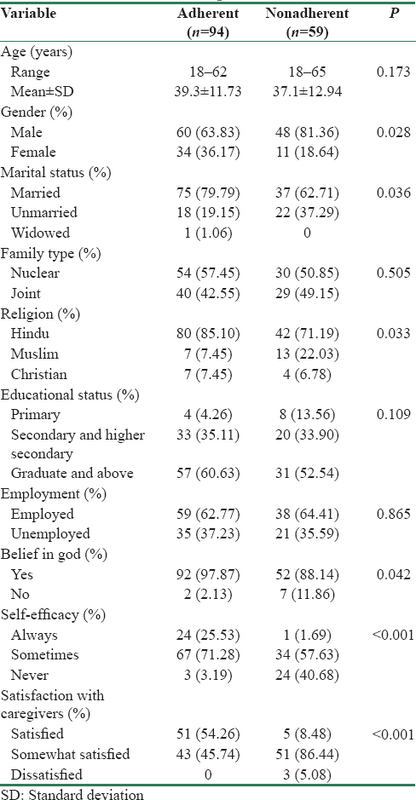 [Table 1] summarizes the baseline characteristics of the study population. Compared to their counterparts from the private sector, transplant recipients at the government hospital were on average about 15 years younger, were less educated, had a lower monthly family income and were less likely to be married. The difference in age distribution was reflected in the employment status. These patients mostly received related donor transplants with an average 1 month longer waiting period. Public hospital patients had less insurance coverage for their transplant-related medical expenses and were correspondingly more reliant on financial assistance from various sources. These demographic and socioeconomic differences at baseline are to be expected as private set-up expenditure is considerably more in the Indian setting and mostly well-off subjects attend these hospitals. As per institutional policy, a fixed immunosuppressant protocol was used for all patients in the government hospital, and private hospitals but in both the sectors for few patients regimen was changed due to specific cause. All patients received induction therapy. Dialysis duration and post-transplantation hospital stay were comparable. Spouse or parents were the primary caregivers for the majority of patients in both the sectors. The adherence rates have been depicted separately for transplantation-related immunosuppressant medications and other medications (for comorbidities) in [Table 2] along with their 95% confidence intervals. This shows that the extent of nonadherence with immunosuppressant regimens was about 31% overall; 44% in the public sector and 19% in the private sector – a statistically significant difference (P < 0.001). The extent of nonadherence with other long-term medication for comorbidities and prophylaxis was however around 19% in both the sectors. [Table 3],[Table 4],[Table 5] depict a comparison of various potential determinants of nonadherence between adherent and nonadherent subjects pooled for both the sectors. Only pooled analysis was done to achieve greater power for the comparisons. There were statistically significant differences in gender distribution, marital status, and religion. Adherent subjects were more satisfied with their economic status. They were more likely to believe in God, be self-reliant, satisfied with their caregivers and less prone to depressed mood. Although their waiting time for transplantation was similar to their nonadherent study counterparts, they were more satisfied with the health information and counseling they received in the interim and after the transplant. Therapy-related factors, such as dialysis duration, type of donor, post-transplant hospital stay; number of postoperative complications before discharge and number of complications in the 12-month post discharge period were mostly comparable between the two groups. However, adherent subjects were more likely to have been adherent during the pretransplant dialysis period, suffered less number of suspected ADRs related to their immunosuppressant regimens, believed to a greater extent that their disease was very severe and could pose additional risk to the disease and had greater overall faith (positive attitude) toward medication use. From the private sector, the main self-reported causes of medication nonadherence were forgetfulness (65.38%), lack of knowledge (11.53%), intentional and experimental (11.53%), and depressed mood (11.53%). From the government sector, the main reported causes were a lack of knowledge (45.54%), financial constraints (18.18%), lack of support person (15.15%), and medicine refill problems (15.15%). Factors deemed to be significant predictors on univariate analysis were entered into a logistic regression analysis. The model quality was good with 96.1% of the cases correctly predicted and Nagelkerke's r2 value of 0.867. However, on multivariate analysis, the economic factor (P = 0.006) was found to be the only significant determinant of the medication nonadherence outcome. The definition of acceptable adherence varies among studies, and there does not seem to be any universally accepted criterion to define good or acceptable adherence. Therefore, considering that both missing doses and delaying dose may adversely affect drug action in the post-transplant setting, we considered a subject to be nonadherent if he or she had failed to take medicines on appointed time more than three times (doses missed or delayed by more than 2 h) in any month during the observation period. It is obvious that stricter criteria would increase the nonadherence rates detected, but this definition was considered clinically relevant and accepted through peer validation. There are only limited numbers of published studies from India that have looked at the medication adherence issue following renal transplantation. In a retrospective study of 152 patients over a median follow-up period of 6.2 years, Sharma et al. reported from a study in Jaipur that 21.7% subjects overall were nonadherent with either medication regimens or visit schedules, and more than half of them were nonadherent with medication. However, we encountered a higher degree of nonadherence with immunosuppressant regimens at 31% overall. The statistically significant difference in this regard between the public sector (44%) and the private sector (19%) requires introspection on the part of both transplant team and administrators in the government hospital. Assessing the extent of nonadherence is important since studies have reported that graft outcome in nonadherent subjects is clearly inferior. Studies from other countries have reported rates similar or higher than ours, such as 46.3% and 32.5% rates of nonadherence for overall medication and 20%–26%,, for immunosuppressants. However, more recent studies from developed countries are reporting lower rates. Nonadherence with medication was associated with lower economic status, lack of belief in God, dissatisfaction with support person, higher levels of depression, unsatisfied health information, higher number of ADRs, nonadherence status in pretransplant period, less perceived severity of the disease, and lack of positive attitude toward medication. These findings are in accordance with the previous studies.,,,,,, Valentine et al. have reported that forgetfulness is a common cause of medication nonadherence which is similar to our study. 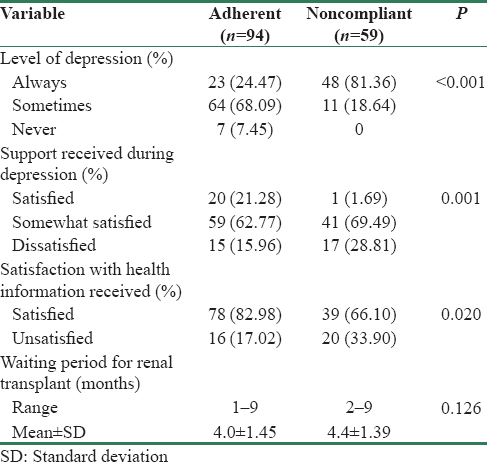 Anxiety and depression are to be expected in renal transplant patients in an Indian setting  and depressed mood and dissatisfaction with caregivers had an association with nonadherence status in our study. Frazier et al. held a similar view. However, Weng et al. have differed in that, after adjusting for sociodemographic factors, stress and depression were not associated with nonadherence in kidney transplant patients. The fact that although multiple potential predictors for nonadherence were identified through univariate analysis but only unsatisfactory economic status was singled out upon multivariate analysis suggests that this is a very important predictor. The policy implications are serious and suggest that renal transplant outcome is intimately linked to socioeconomic status of patients and their families. This relationship is not unique to India and has been reported earlier. It is actually a complex issue for families and the society because long-term outcomes after transplantation are better for adherent than for nonadherent patients and lifetime costs after transplantation in the adherent patient group are likely to be higher than lifetime costs in the nonadherent patient group, mainly because adherent patients live longer after transplantation. Thus, it should not be assumed that satisfactory economic status will automatically lead to improved outcome. This study has limitations too. First, sampling was purposive. More importantly we followed-up patients for only 1 year and therefore are not in a position to link nonadherence and its potential determinants with long-term outcomes and survival. Few patients dropped out from the follow-up, and they were excluded from the analysis. Since dropped out respondents, including transplant recipients, would have high chance of nonadherence, we may have underestimated the extent of nonadherence to some extent. Illiteracy is often associated with low economic status and therefore exclusion of illiterate subject from the study might introduce bias with regards to risk factors. However, the prospective and close follow-up is the strength of the study. Furthermore, patients were recruited from the government as well as private hospitals thereby covering diverse socioeconomic background. To identify medication adherence and its determinants, we used self-report method along with cross-checking of the information from caregivers. We believe that this study has updated the issue of nonadherence in renal transplant recipients in the Indian setting. We have assessed the incidence and identified potential determinants that merit further exploration in future studies. Strategies to improve medication adherence can be planned by relevant stakeholders on the basis of these findings. We are grateful to Head of the Department of Nephrology and to the Director, Institute of Postgraduate Medical Education and Research and SSKM Hospital, Kolkata, for providing permission and logistic support to carry out this work. We are thankful to the West Bengal University of Health Sciences for facilitating this work. Chisholm MA. Issues of adherence to immunosuppressant therapy after solid-organ transplantation. Drugs 2002;62:567-75. Dew MA, DiMartini AF, De Vito Dabbs A, Myaskovsky L, Steel J, Unruh M, et al. Rates and risk factors for nonadherence to the medical regimen after adult solid organ transplantation. Transplantation 2007;83:858-73. Didlake RH, Dreyfus K, Kerman RH, Van Buren CT, Kahan BD. Patient noncompliance: A major cause of late graft failure in cyclosporine-treated renal transplants. Transplant Proc 1988;20 3 Suppl 3:63-9. Morisky DE, Green LW, Levine DM. Concurrent and predictive validity of a self-reported measure of medication adherence. Med Care 1986;24:67-74. Sabate E. Adherence to Long-term Therapies: Evidence for Action. Geneva: World Health Organization; 2003. Rosenberger J, Geckova AM, van Dijk JP, Roland R, ven den Heuvel WJ, Groothoff JW. Factors modifying stress from adverse effects of immunosuppressive medication in kidney transplant recipients. Clin Transplant 2005;19:70-6. Lennerling A, Forsberg A. Self-reported non-adherence and beliefs about medication in a Swedish kidney transplant population. Open Nurs J 2012;6:41-6. Sharma AK, Gupta R, Tolani SL, Gupta H, Singh AK, Rathi GL. Non-compliance in renal transplantation. Indian J Nephrol 1999;9:13-5. Varma PP, Baliga KV, Hooda AK, Gedela SR. Graft outcome in non-compliant renal transplant recipients. Indian J Neprol 2004;14:142. [Absract]. Ghods AJ, Nasrollahzadeh D. Noncompliance with immunnosuppressive medications after renal transplantation. Exp Clin Transplant 2003;1:39-47. Raiz LR, Kilty KM, Henry ML, Ferguson RM. Medication compliance following renal transplantation. Transplantation 1999;68:51-5. Sketris I, Waite N, Grobler K, West M, Gerus S. Factors affecting compliance with cyclosporine in adult renal transplant patients. Transplant Proc 1994;26:2538-41. Nevins TE, Kruse L, Skeans MA, Thomas W. The natural history of azathioprine compliance after renal transplantation. Kidney Int 2001;60:1565-70. Butler JA, Peveler RC, Roderick P, Smith PW, Horne R, Mason JC. Modifiable risk factors for non-adherence to immunosuppressants in renal transplant recipients: A cross-sectional study. Nephrol Dial Transplant 2004;19:3144-9. Weng FL, Chandwani S, Kurtyka KM, Zacker C, Chisholm-Burns MA, Demissie K. Prevalence and correlates of medication non-adherence among kidney transplant recipients more than 6 months post-transplant: A cross-sectional study. BMC Nephrol 2013;14:261. Frazier PA, Davis-Ali SH, Dahl KE. Correlates of noncompliance among renal transplant recipients. Clin Transplant 1994;8:550-7. Vasquez EM, Tanzi M, Benedetti E, Pollak R. Medication noncompliance after kidney transplantation. Am J Health Syst Pharm 2003;60:266-9. De Geest S, Borgermans L, Gemoets H, Abraham I, Vlaminck H, Evers G, et al. Incidence, determinants, and consequences of subclinical noncompliance with immunosuppressive therapy in renal transplant recipients. Transplantation 1995;59:340-7. Greenstein S, Siegal B. Compliance and noncompliance in patients with a functioning renal transplant: A multicenter study. Transplantation 1998;66:1718-26. Douglas S, Blixen C, Bartucci MR. Relationship between pretransplant noncompliance and post transplant outcomes in renal transplant recipients. J Transpl Coord 1996;6:53-8. Valentine A, Russell S, Taylor R, Short CD, Johnson RW. Is it any wonder they don't take their tablets? [Abstract] The First European Symposium on Non-compliance in Transplantation 4-6 February, 1999, Hof Bei Salzburg, Austria. Nephrol Dial Transplant 1999;14:1811. Jana AK, Sircar D, Waikhom R, Praharaj SK, Pandey R, Ray Chaudhury A, et al. Depression and anxiety as potential correlates of post-transplantation renal function and quality of life. Indian J Nephrol 2014;24:286-90. Kalil RS, Heim-Duthoy KL, Kasiske BL. Patients with a low income have reduced renal allograft survival. Am J Kidney Dis 1992;20:63-9. Cleemput I, Kesteloot K, Vanrenterghem Y, De Geest S. The economic implications of non-adherence after renal transplantation. Pharmacoeconomics 2004;22:1217-34.